Knee ligament injuries are very common. Getting back to full strength is essential for complete recovery. Levitation®2, the world’s only compact and powerful bionic knee brace can get you back to your normal activities, sooner. Levitation is designed to promote faster recovery and a safe return to weight-bearing activities. Our braces act like a shock absorption device to increase stability and confidence as you bend your knee and restore your normal range of motion. Then, as you straighten your legs, Levitation assists the quadriceps to promote pain-free muscular contraction. This allows patients to regain complete muscle strength and stability during controlled rehabilitation exercises before returning to normal activities. 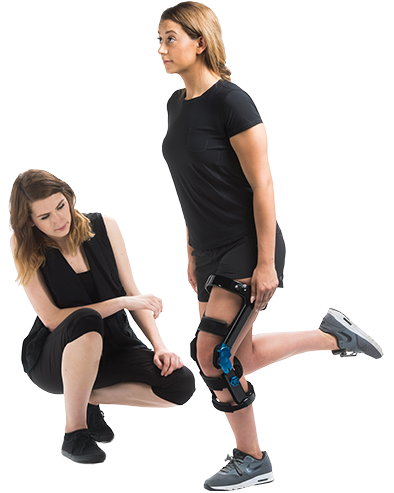 For ACL patients, the brace can be configured to only assist deeper angles of knee flexion. As the patient regains their strength and stability, the spring-loaded assist can be gradually reduced, then turned off, leaving you with a traditional, functional knee brace that increases stability and helps protect the knee. This feature can be particularly important for ACL injuries, since the ACL is more susceptible to injury when the knee is nearly or fully straightened. Whether your knee ligament injury is brand-new, or if it’s an injury you’ve been living with for a while, Levitation can help you do more of what you love, both on and off the field. Read more about how Levitation can be used to promote better rehabilitation after injury or surgery here. Our revolutionary bionic knee braces do more than just stabilize your knee. The Levitation bionic hinge enhances your leg muscle power by storing energy as you bend your knee and returning that energy as you straighten your leg. The result is the world’s only compact and powerful bionic knee brace capable of augmenting strength and reducing pain during exercise and rehabilitation. Our proprietary hinge mechanism relies on state of the art engineering and was inspired by the landing gear in high performance aircraft.